Several years ago, I took on the coordination of a large, introductory film studies unit, entitled Contemporary Popular Film. A look over items that had been screened in that unit previously – films like Nénette et Boni (Claire Denis, 1996), Ed Wood (Tim Burton, 1995) and Benny’s Video (Michael Haneke, 1992) – had me wondering exactly what the “popular film” of the unit title referred to. And I was even more perplexed when I discovered that, rather than begin with readings on “the popular” – say, Raymond Williams, Stuart Hall, Tony Bennett, or perhaps more obviously something like Approaches to Popular Film, edited by Joanne Hollows and Mark Jancovich (1) – the unit outline drew heavily on a book that I’d never heard of: The Art of Watching Films by Joseph M. Boggs (2). The book is now in its seventh edition and, with all due respect to Professor Boggs (and his recently recruited co-author, Dennis W. Petrie), just a glance through The Art of Watching Films was all it took to convince me that this brand of film studies – developed from within a 1970s English department at Western Kentucky University – would not be my first choice for a renovated first-year unit, now entitled Contemporary Film Studies (c. 2002). Having said this, and coming around to the question of Pam Cook’s The Cinema Book, I’d have to admit to now owning an instructor’s copy of The Art of Watching Films, along with several other introductory film studies textbooks that have been sent to me by academic publishers. Just some of these include: David Bordwell and Kristen Thompson’s Film Art: An Introduction; Timothy Corrigan and Patricia White’s The Film Experience: An Introduction; Robert Kolker’s Film, Form and Culture; The Oxford Guide to Film Studies, edited by John Hill and Pamela Church Gibson; Peter Lehman and William Luhr’s Thinking About Movies; Introduction to Film Studies, edited by Jill Nelmes; Maria Pramaggiore and Tom Wallis’ Film: A Critical Introduction; and Stephen Prince’s Movies and Meaning (3). This is by no means an exhaustive list. It puts to one side, for instance, those introductory books that make US cinema their singular focus – for example, John Belton’s American Cinema/American Culture; Richard Maltby’s Hollywood Cinema; and Contemporary American Cinema, edited by Linda Ruth Williams and Michael Hammond (4) – and those that take a greater interest in film theory: for example, The Film Studies Reader, edited by Hollows, Peter Hutchings and Jancovich; Film Theory and Criticism, edited by Leo Braudy and Marshall Cohen; and, most recently, The SAGE Handbook of Film Studies, edited by James Donald and Michael Renov (5). Adjusting the third edition to the context of “globalisation, diversification and the proliferation of production, distribution and exhibition sites” and an associated “burgeoning interest in world cinema” (p. ix), The Cinema Book now falls into seven sections: Hollywood Cinema and Beyond; The Star System; Technologies; World Cinemas; Genre; Authorship and Cinema; and Developments in Theory. Of these, Cook contributes (as she has in earlier editions) substantially to the entries on authorship, leaving other sections to leading international scholars: for example, Richard Abel on early cinema, Thomas Schatz on the Hollywood studio system, Barbara Klinger on reception contexts, Bill Nichols on documentary film, James Naremore on film acting, Steve Neale on film genre, and Robert Stam on Third World and postcolonial cinema. In part a symptom of – though not solely attributable to – Cook’s recent visits to Australia, there are a significant number of entries by Australians (and Aussie alumni): most obviously, Brian McFarlane on Australian cinema, but also Angela Ndalianis (art cinema), James Donald (stars), Chris Berry (Chinese cinema), Stephen Teo (Hong Kong cinema), Toby Miller (authorship), Barbara Creed (feminist film theory), and Noel King (on several topics: new Hollywood, authorship and – in the final word – postmodernism and film). A film studies unit like Contemporary Film Studies seeks to devote, in its twelve-week semester, introductory lessons to: film narrative, form and sound; film genre and authorship; documentary and experimental film; national cinemas; ideology, audiences and institutions; and film history. Aside from a deficiency when compared to textbooks (notably Film Art) that invest in an account of “basic cinematic technique – mise-en-scene, cinematography, editing, sound” (6), The Cinema Book provides – across the 600 pages of this massive new edition – remarkably good coverage over this range of topics. It’s also a book – and here, again, one that is aware of the competition from accompanying DVDs and Online Learning Centres that attend such books as Film Art – that is extensively illustrated with film stills, production and publicity materials, and (grey box) case studies. But one might still ask – as does Robert Ray’s review of Reinventing Film Studies, edited by Christine Gledhill and Linda Williams (7) – for something more, or different, from a book introducing (a new generation of) students to film. Writing in another BFI publication – Sight and Sound magazine – Ray argues that the discipline of film studies is made up of film theory (film in principle) and film history (film in practice) (8). He goes on to borrow (or abduct) some words from Theodore Adorno to posit a “perfect definition of cinema”: “cinema is located at the crossroads of magic and positivism” (9). From here, Ray argues that the aim of academic film studies has become to “break cinema’s spell” – to make us aware of its textual or institutional or ideological operations – but that the project of a “reinvented film studies should be to penetrate movies’ veil while retaining their hallucinatory quality” (10). In his review, Ray advances an agenda that he develops at length in The Avant-Garde Finds Andy Hardy (11) – that film studies remake itself through the formal lessons of a Walter Benjamin, a Jacques Derrida, or a Roland Barthes – and laments the fact that “Reinventing Film Studies contains not a single experimental piece” (12). In this respect, as substantial and satisfying as this new edition of The Cinema Book is (and ought to be for the many colleges and universities, around the USA, that presently read The Art of Watching Films), some of us might take up Cook’s idea of “sampling” and appeal to the publisher’s nightmare: the student reading pack. Assembled apart from the commercial imperatives of educational publishing, the student reading pack, or unit reader, perhaps provides opportunity for a more “shamanistic” mix of readings: for instance, to maintain the BFI-Aussie connection, something from Lesley Stern’s The Scorsese Connection or Sam Rohdie’s Promised Lands (13), or maybe a piece of criticism from Meaghan Morris or Adrian Martin. For, as Martin reminds us: “in [film] writing as much as in film, we must come to close terms with what is ‘at once mysterious and materialistic’ in matters of style” (14). 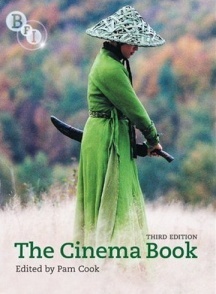 The Cinema Book, edited by Pam Cook, third edition, BFI Publishing, London, 2008. Joanne Hollows and Mark Jancovich, eds, Approaches to Popular Film, Inside Popular Film series, Manchester University Press, Manchester, 1995. Joseph M. Boggs and Dennis W. Petrie, The Art of Watching Films, seventh edition, McGraw-Hill, New York, 2006. David Bordwell and Kristen Thompson, Film Art: An Introduction, eighth edition, McGraw-Hill, New York, 2008; Timothy Corrigan and Patricia White, The Film Experience: An Introduction, Bedford/St Martin’s, Boston and New York, 2004; Robert Kolker, Film, Form and Culture, third edition, McGraw-Hill, New York, 2006; John Hill and Pamela Church Gibson, eds, The Oxford Guide to Film Studies, Oxford University Press, Oxford and New York, 1998; Peter Lehman and William Luhr, Thinking About Movies: Watching, Questioning, Enjoying, third edition, Wiley-Blackwell, Malden, 2008; Jill Nelmes, ed., Introduction to Film Studies, fourth edition, Routledge, London and New York, 2007; Maria T. Pramaggiore and Tom Wallis, Film: A Critical Introduction, Allyn and Bacon, Boston, 2006; Stephen R. Prince, Movies and Meaning, fourth edition, Allyn and Bacon, Boston, 2006. John Belton, American Cinema/American Culture, second edition, McGraw-Hill, 2004; Richard Maltby, Hollywood Cinema, second edition, Blackwell Publishing, Malden, 2003; Linda Ruth Williams and Michael Hammond, eds, Contemporary American Cinema, Open University Press, Maidenhead, Berkshire, 2006. Hollows, Peter Hutchings and Jancovich, eds, The Film Studies Reader, Hodder Arnold, London, 2000; Leo Braudy and Marshall Cohen, eds, Film Theory and Criticism, sixth edition, Oxford University Press, Oxford and New York, 2004; James Donald and Michael Renov, eds, The SAGE Handbook of Film Studies, SAGE Publications, London, 2008. Bordwell and Thompson, p. xviii. Christine Gledhill and Linda Williams, eds, Reinventing Film Studies, Hodder Arnold, London, 2000. Robert B. Ray, “Mystery Trains”, Sight and Sound, November, 2000, pp. 12–13. Robert B. Ray, The Avant-Garde Finds Andy Hardy, Harvard University Press, Cambridge, 1995. Ray, “Mystery Trains”, p. 12. Lesley Stern, The Scorsese Connection, BFI Publishing, London, 1995; Sam Rohdie, Promised Lands: Cinema, Geography, Modernism, BFI Publishing, London, 2001. Adrian Martin, “Mise en scene is Dead, or The Expressive, The Excessive, The Technical and The Stylish”, Continuum, vol. 5, no. 2, 1992, p. 131.